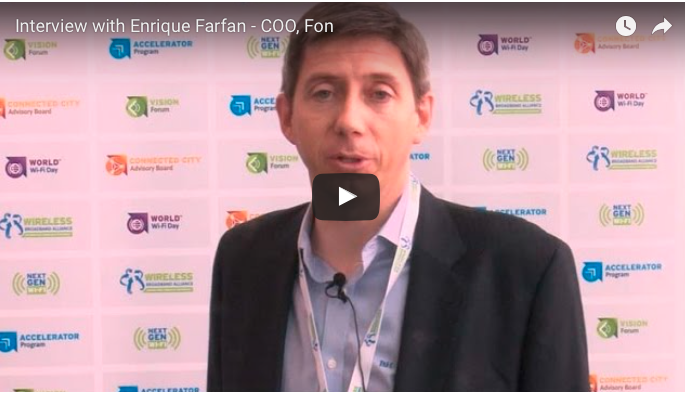 Last month, our COO Enrique Farfán spoke at the Wireless Broadband Alliance’s Wireless Global Congress 2016 summit in Liverpool. We had a great time exchanging ideas about the evolution of the industry, and sharing what’s new with Fon! Enrique unveiled Fon’s WiFi Service Management Platform, a cloud solution that enables service providers to deliver WiFi services to just about any customer segment, ranging from residential to small & medium sized businesses, as well as big venues such as hotels, or even entire cities. The future is all about connectivity, and service providers stand in a privileged position to deliver these connected services to their customers. For more insights on Fon’s new platform, future trends, and where we are going, check out Enrique’s interview conducted by the WBA team.